If you are looking for leather luggage straps, you have come to the right place. MyBinding.com carries a huge assortment of genuine leather luggage straps in different lengths, colors and widths. Packaged with 25 straps per bag, these high quality leather luggage straps have wonderful nickel-plated buckles and offer a look and feel that far surpasses the leatherette vinyl luggage straps that other vendors sell. We also carry a huge selection of genuine leather luggage straps with brass-plated buckles if that is the look that you prefer. Choose a genuine leather luggage strap for your organization. You won't be disappointed. Transcript: Welcome to MyBinding Video. 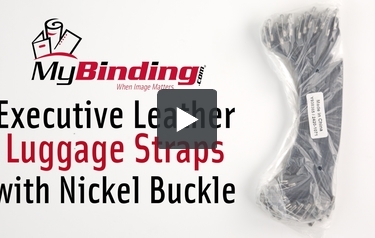 These are the Executive Leather Luggage Straps with Nickel Buckles from MyBinding. Show off your luggage tag on a genuine leather strap with a shimmering nickel buckle. They’re a half inch wide, seven inches long and have three adjustment holes for the buckle. The leather is strong to stand up to wear, feels great, and looks professional. These straps are available in packs of 25. For more videos and all your binding needs, visit MyBinding.com. Welcome to MyBinding Video. These are the Executive Leather Luggage Straps with Nickel Buckles from MyBinding. Show off your luggage tag on a genuine leather strap with a shimmering nickel buckle. They’re a half inch wide, seven inches long and have three adjustment holes for the buckle. The leather is strong to stand up to wear, feels great, and looks professional. These straps are available in packs of 25. For more videos and all your binding needs, visit MyBinding.com.